I love pulling different colors together and seeing how the inspiration unfolds. The lavender on cream with the Waterberry Green accents have such a calming effect. I would use this color scheme in a powder room or luxury bathroom. On the left is a large scale floral wallpaper with a cream background by Thibaut. 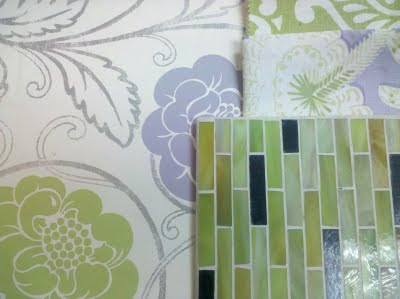 Fabrics include a Waterbury Green Leaf pattered cotton and a coordinating Equador floral with lavender and cream. The tile piece is a mixed-up mosaic in a brick pattern made up of green glass with spots of gun metal.